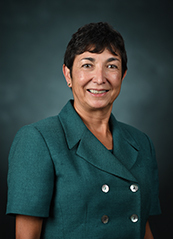 Cecilia Botero, Dean of University Libraries at the University of Mississippi, received her MLIS from the University of Texas at Austin. Before coming to the University of Mississippi she served as the Associate Dean for Discovery and Access, George A. Smathers Libraries and Fackler Director of the Health Science Center Libraries at the University of Florida. Among her many interests in the field of academic librarianship include conducting user studies and surveys; collaborating with partner libraries and consortium; enhancing evidence-based collection and budget strategies; creating new and exciting library space; offering additional resources and developing innovative services for faculty, researchers and students.